February 9, 2015 By This post may contain affiliate links. Chocolate might reign supreme as the sweet choice for Valentine’s Day but if something lighter tickles your fancy, then these Meringue Heart Cookie Pops just might make your heart go all aflutter. Hi everyone! I’m Marilyn Johnson the “baker, entertainer and cocktail shaker” at Pink Martinis and Pearls! 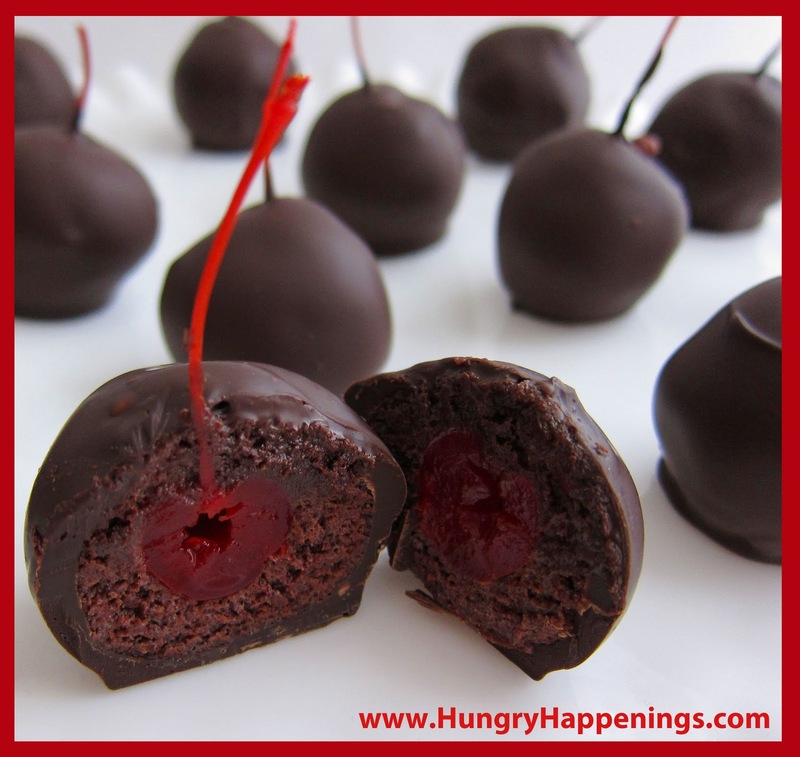 I’m thrilled to be a contributor for Hungry Happenings and hope you come over to visit and say “hello” on my blog too! 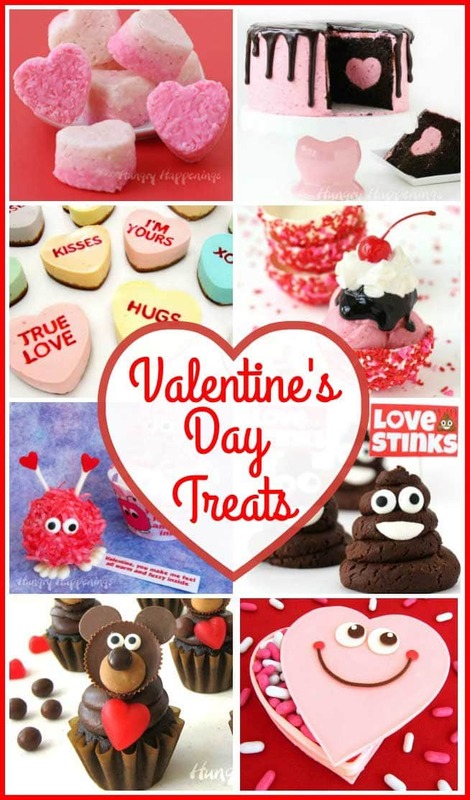 Today I’m sharing with you one my favorite and unique treats for Valentine’s Day – Meringue Heart Cookies that are then assembled to make Heart Pops! They’re festive and great for giving to all your sweethearts! Meringue cookies are fast to whip up and easy to form whether the meringue is dropped by teaspoons onto cookie sheets to resemble chocolate kisses, or, as I’ve done, by piping the meringue through a 1/2 inch plain, round cake decorating tip placed in a pastry bag. Are you ready to make the Meringue Heart Pops? If you’ve made the meringue hearts you only need a few more things to transform them into pops. Pair up like-sized and shaped meringue hearts. Melt candy coating to a spreadable consistency. Place sprinkles in a shallow dish. Flatten end of straw 1 inch. Cover back of one heart with candy coating spreading it to the edges. Place the other heart cookie on top squeezing slightly so the candy coating oozes out around the edges forming a ridge. The ridge will hold the sprinkles. If it doesn’t ooze enough, take a toothpick and fill in the spaces with more chocolate. Dip the pop into the sprinkles. Lay assembled pop flat to set. I hope you enjoyed the DIY Meringue Heart Pops tutorial and that you make them for the sweethearts in your life! They keep really well so they are perfect to make ahead to have on hand each wrapped in a cello bag and tied with a pretty ribbon. I take a bunch with me on Valentine’s Day errands and hand them out as I go. It always makes someone smile and feel special. I’ve enjoyed meeting all of you in the Hungry Happenings’ community. 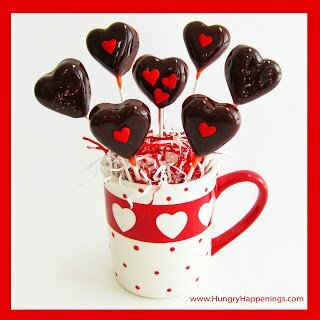 Thank you, Beth, for inviting me to Hungry Happenings today to share my Meringue Hearts and Pops! Pink Martinis and Pearls that you might enjoy! Thanks so much for contributing your lovely project, Marilyn! These are so pretty. I love how you made the pops too. It's great that you're here at Hungry Happenings – I love the fluffiness of the meringue cookies and the way they are sandwiched between the straws looks GREAT! Thank you for the warm welcome, Kim. The pops are so delicious. That perfect combination of crunch and chewiness of the meringue and the smoothness of the candy coating – perfect taste sensation! It's so nice to see a meringue pop … something a little different! Pink, puffy and sweet … perfect for Valentine's Day! 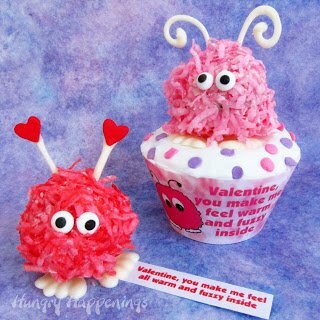 What gorgeous little Valentine's inspired treats. These heart meringue pops are just beautiful! What a wonderful treat for Valentine's Day! Love these!